Health Start Fatherhood supports expecting fathers and fathers with children under the age of 2. One of the goals is to educate participants about the physical and emotional impact of pregnancy on relationships. A primary focus in on teaching fathers parenting skills and providing help in accessing medical, legal and social services. 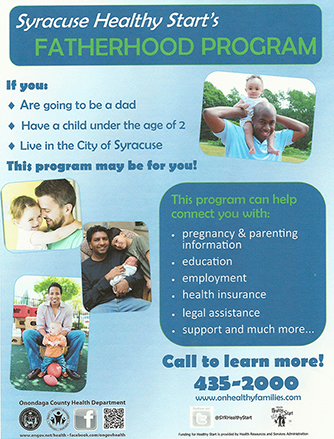 Healthy Start Fatherhood is funded by Onondaga County Health Department. Program Hours: Monday – Friday 9 a.m. to 5 p.m.